The Incredible Hulk gets 'er done, but while "Hulk smash!" is essential, it's also undeniably uninteresting when handed over to a computer. 113 min. Universal Pictures. Director: Louis Leterrier. Cast: Edward Norton, Liv Tyler, Tim Roth, William Hurt, Christina Cabot. "Give me a real fight!" So hollers the steroidal bad guy Abomination in The Incredible Hulk. For most of the film, the audience has sided with smart, sensitive Bruce Banner, but at the outset of the city-busting climax, the villain speaks for those blockbuster-movie fans who hated the restless creativity of Ang Lee's 2003 film Hulk. Louis Letterier's start-from-scratch "non-sequel" gives that audience what it wants, devolving from a smart opening all the way to "Hulk smash!" and ironically laying waste to two institutions of higher learning on the way. The Incredible Hulk gets 'er done, but while "Hulk smash!" is essential, it's also undeniably uninteresting when handed over to a computer. Following the trend in comic-book-derived movies, The Incredible Hulk benefits enormously from a cast that's not only "A-list" but prominently talented. Edward Norton plays scientist-turned-fugitive Bruce Banner, whose disasterous exposure to gamma rays has turned him into a freak: when pushed beyond the point of anger, his muscles boil over and he turns into a power-mad green behemoth. Sensibly, the script by Zak Penn (with a significant, uncredited rewrite by Norton himself) begins not with an overblown action scene, but by revising the origin in a quick prologue, then laying out what life is like on the run for Banner. He's laying low with a job at a Brazilian bottling factory, receiving jiu jitsu training with a focus on breathing to control his heart rate, and anonymously corresponding with a scientist who offers hope of a cure to his condition. On the run, Banner determines to find the data on his experiment and deliver it to the professor (a scary-funny Tim Blake Nelson) who has been brainstorming about controlling Banner's "Hulk outs." His path will lead him to ex-girlfriend Betty Ross (Liv Tyler), the estranged daughter of General Ross. Unfortunately for Ross, Blonsky so likes the taste of his newfound power that he loses interest in capturing the Hulk—instead, he wants to become the Hulk, the better to beat his formidable adversary to a pulp. And so classic Hulk villain "Abomination" rises in all his spiky glory. In the haste to reach the inevitable Hulk-Abomination showdown—set, oddly enough, on the streets of Harlem—the film somewhat loses the thread of Blonsky's escalating madness, but it's in the film's design to get less thoughtful and more action-oriented as it goes. Leterrier's film gets a lot right. Primarily, it succeeds in advancing the new Marvel Films battle plan to stay true to its comic-book universe and build franchises that will dovetail into an Avengers team-up movie. To that end, the opening montage of headlines includes flashes of "Stark Industries" and "Nick Fury"—before the film's end, a major Marvel hero (and major star) from a parallel franchise makes a cameo appearance. Also, Penn and Norton's script is witty in a way pleasing to the action crowd and smugly satisfying to fans (jokes about purple stretchy pants; cameos by Hulk co-creator Stan Lee and TV Hulk Lou Ferrigno, among others). The film repeatedly references the old Bill Bixby TV series The Incredible Hulk, a pleasingly uncomplicated source for this fugitive plot: hide, run, get cornered, get angry. The new film has been misleadingly hyped as less talky and more action-packed than its predecessor. There's plenty of action, but there's plenty of talk to ground it, which works except in the soggy scenes between Banner and the laughably moony Betty. Tyler has two speeds here: empathetic earth-mother and emotional mess. Her stress manifests in wide, misty eyes or screams directed at the bad guys with no nervous tics in between. It's hard to blame her since the script offers her "Fay Wray" little more than the film's worst scene: a breather in a cave that's redundant to the first film's "Beauty and the Beast" motif. The Incredible Hulk's biggest disappointment is Leterrier's failure to guide the action sequences and special effects with a sure hand. The director starts strong with the chase-fight in Brazil. Here, Hulk is cloaked in shadows (and later, briefly, in mist), and the gambit of shooting close and editing with quick cuts effectively catches us, like Banner, off guard. But Leterrier (The Transporter) never varies the bumpy camera moves, tight shots, and quick cuts in later scenes. It's yet another modern action movie that hides the big picture of each action scene in sensory overload. As for the Hulk himself, he doesn't look any more real than last time—quite the contrary. That big showdown plays like what it is: an animated scene dropped into a live-action movie. If Leterrier were doing his job right, the scene would make us forget what we're watching isn't real. The Incredible Hulk is a mixed bag, but it's Leterrier's best work (whew!) and not a failure as a movie. Whether or not it's enough to "resuscitate" a franchise perceived to be on life support (despite the first film's $245 million+ worldwide take) is an open question, but an early-summer promotional assist by Iron Man seems to have succeeded in whetting appetites. Since The Incredible Hulk furthers the Marvel brand, it can't go too wrong in the marketplace. Right? Hulk smash? Universal "Hulks out" on Blu-ray with a special edition that bursts at the seams. Though it's mirrored on a 3-disc DVD SE, the Blu-ray can't be beat in its rock-solid picture quality and thunderous DTS-HD Master Audio (plus, dig the limited edition "Green-ray" packaging: you know you want it). The detail provided in high-def Blu-ray is spot-on, capturing every nuance within director Louis Leterrier's ever-moving frame. The palette is accurate and the image clean and sharp. 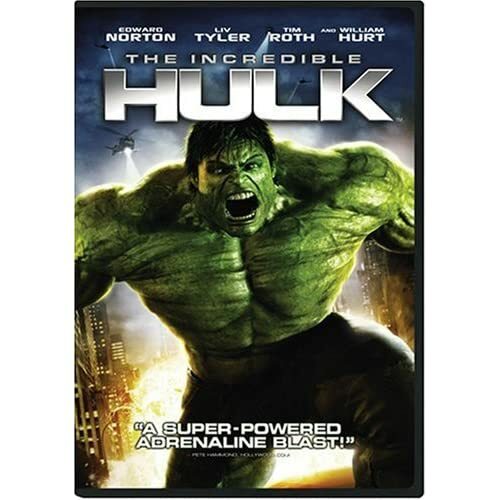 The surround soundtrack options will all give your home theater the workout you would demand of an action title like The Incredible Hulk--the immersive theatrical experience is duly recreated in a meticulous mix. As usual, Universal supplies a U-Control menu, and this one's loaded with numerous options, starting with the Thunderbolt Files. These constitute a Mission Overview (a few basics about General Ross' mission), Intel Tracking (GPS maps to keep track of Bruce Banner/Hulk), and Active Personnel (character bios). The innovative Scene Explorer option brings up a four-paneled PiP window enabling easy access to four views for each of several key scenes: storyboard, animatic, and two stages of special effects development. Select any one, and you get a full-screen HD view of that view. Comic Book Gallery periodically displays a comic-book cover or panel as a point of comparison to a shot in the film. Animated Comic displays "From Comic Book to Screen" (see below), and a full PiP track offers raw set footage corresponding with many scenes, as well as cast and crew interviews. All of these features can be directly accessed from the U-Control menu or selected to pop up as clickable icons during playback when U-Control is enabled. The disc also includes an audio commentary by director Louis Leterrier and actor Tim Roth. They're an enthusiastic and talkative duo, and the game Roth makes a fine substitute for the conspicuously absent Edward Norton. Norton turns up in all of the video-based making-of documentaries, however, beginning with "The Making of Incredible" (29:54 with "Play All"). Presented in HD, this doc gives a fairly detailed look at the film's production, the highlight being lots of high-def behind-the-scenes footage. The doc covers how Leterrier was hired to helm the Hulk reboot, how the cast was assembled, and how stunts were created, including the chaos in Harlem (recreated in Toronto). Interview subjects include Leterrier; producers Kevin Feige, Avi Arad, and Gale Anne Hurd; Norton; executive producer Jim Van Wyck; Liv Tyler; Tim Roth; William Hurt; production designer Kirk M. Petruccelli; visual effects supervisor Kurt Williams; Capt. Nicole Meszaros of Canadian Forces Base Trenton; picture car coordinator Scott Magee; special effects coordinator Laird McMurray; stunt coordinator John Stoneham Jr.; second unit first assistant director Andrew Robinson and second unit second assistant director Joe Hay. "Becoming the Hulk" (9:22 in HD) and "Becoming the Abomination" (10:16) cover how the actors and technicians collaborated to create the perfomances of the respective monsters. Here, you'll find the coolest behind-the-scenes footage, with Norton and Roth delivering facial and full-body performances of their creature counterparts and technicians digitally capturing and adapting the actors' work. We also see stunt performers in mo-cap suits giving Roth a turn in his own mo-cap suit, and Norton filming "lo-fi" video reference for Hulk's body language. Interviewees include Norton, Roth, Leterrier, Feige, Williams, character designer Aaron Sims, Hurd, Mova founder and president Steve Perlman, Lou Ferrigno, movement coach/motion capture Terry Notary and, from Rhythm & Hues, senior animation supervisor Keith Roberts, character rigging supervisor Matt Derksen, lighting supervisor Greg Steele, and visual effects supervisor Betsy Paterson. Also in HD, "Anatomy of a Hulk-Out" (27:50 with "Play All") gives the lowdown on the three major "Hulk-out" sequences: "Hulking Out in the Bottling Plant," "Hulking Out on Campus," and "Hulking Out in Harlem." The above participants and additional special effects and stunt personal share secrets as we see with our own eyes the onset magic and desktop wizardry that went into creating each scene. "From Comic Book to Screen" (6:33) is a modestly animated sequence presenting the original panels from Jeph Loeb & Tim Sale's comic Hulk: Gray. It's a nifty inclusion, demonstrating how one of the film's most memorable scenes took its inspiration directly from one of the seminal Hulk comics. Rounding out the disc are BD Live chat capability and a digital copy of the film on a second disc included in the package. The Incredible Hulk is definitely a "smash" on home video, and before any fans get too squirelly, I'm willing to bet the missing deleted footage might have been withheld for a good reason: perhaps those scenes will be repurposed in the already announced sequel. Until then, geek out with a stellar special edition. All site content © 2000-2019 Peter Canavese. Page generated at 04/18/2019 02:37:54AM.